Midleton Event on alternative environment-friendly household cleaning agents. Midleton Tidy Towns and Supervalu Store Midleton are co-osting an environmentally friendly shopping event. The event is being supported by on the day by Sinéad Ní Mhainnín, Galway County Council and Pauline McDonogh, Limerick Clare Kerry Regional Waste Management Office. • Discussion on their use & effectiveness. 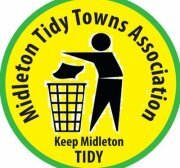 Bring along your completed survey form from Midleton Tidy Towns or fill one out at the counter on the day and your could win one of 6 shopping vouchers for €50.